The chart to the right shows the distressed sales(foreclosures & short sales) as a percentage of sales for the month of May 2012 for various cities. Comparing this against the same chart from a year ago offers some good perspective regarding the trend we’ve seen since a year ago. 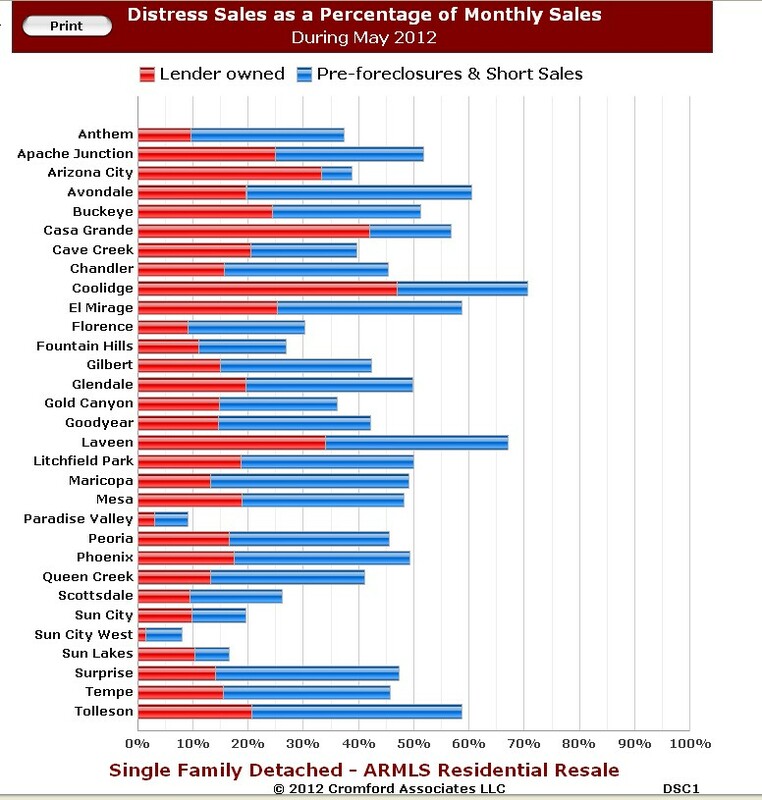 * The % of foreclosures/REO’s fell in every city, except for Sun Lakes. In some cases it was in excess of a 30% reduction of foreclosures. Fewer homes are receiving foreclosure notice (notice of trustee sale) than in previous years. * In most cities, the percentage of short sales as a % of total sales increased from 2011. 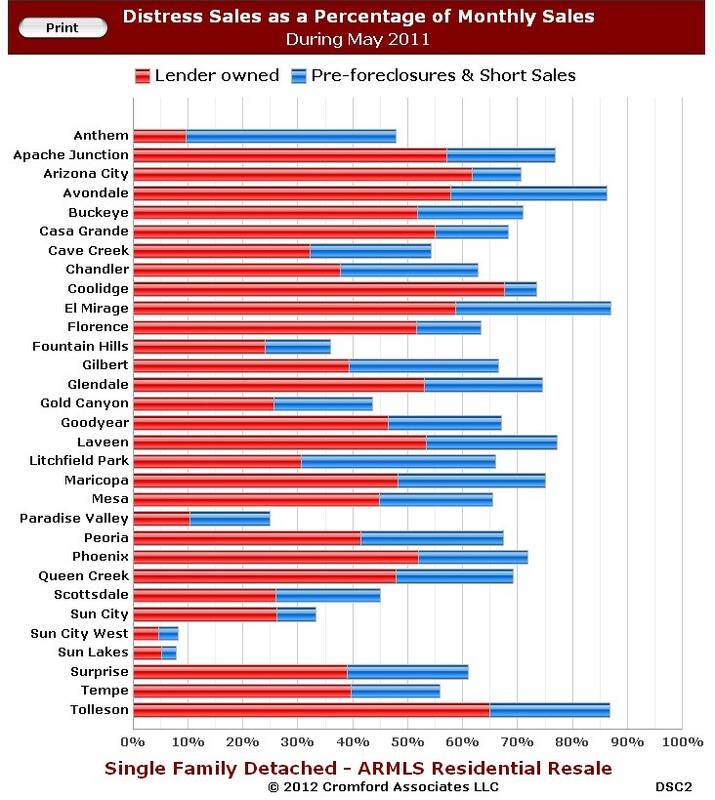 Banks see a short sale as a more favorable transaction than a foreclosure. Some banks have starting contacting homeowners who are in default and not eligible for a loan modification offering them a relocation incentive to carry out a short sale. Homeowners are also learning about the benefits of a short sale vs. a foreclosure which could account for the increase in the % of short sales from mid-2011 to mid-2012. * The overwhelming trend is that distressed sales (foreclosures & short sales) are in decline and normal/traditional sales are gradually becoming the norm. As prices increase, which they are doing, the % of short sales will decrease. Below is a table by city with the % of distressed sales for May 2011 and May 2012 with the third column being the decrease for each city. Distressed sales are foreclosures and short sales. Most all of the cities are seeing double digit decreases in the % of distressed sales for the last 12 months. This is very postive news, and comes as a surprise to many buyers that have been conditioned by the constant and unrelenting national news that foreclosures are increasing and the continued downward real estate spiral. Not in Phoenix. Properly priced homes are now receiving multiple offers and the months supply of inventory is the lowest since 2005 for most cities in the valley, and homeowners can expect double digit appreciation for 2012. If you have any questions regarding your property value or the trend in your neighborhood, please contact me at 480-326-8571.